Sitting on your bike puts you in a great position for creating power and relieves pressure on your legs; however, a seated position can limit your control over your bike. When you want to “attack” the trails, you need to be standing in an aggressive yet neutral position. Your belly button should be aligned directly above your bottom bracket and your chin should be over the stem. Keep your core tight, your back level to the ground and your legs and elbows bent at an equal angle. It’s also crucial that you keep your elbows high and pointed upwards, but not in an exaggerated position. Replicating the look of a motocross racer won’t offer you the best control over your bicycle. Keep your shoulders down and make sure to hinge at your hips in order to enhance bike control. The stance we’re describing here is referred to as the “attack position.” The attack position can be used any time a rider is out of the saddle. In fact, it should become a natural stance that you return to every time you are out of the saddle. When you are seated on your bike, your hips are locked to the saddle, making it a lot harder to let the bike move underneath you. A fast rider will often hold a balanced, front-to-back and side-to-side position over his bike while allowing the bike to move freely under him. We’ll talk more about this soon. Many riders imagine a street bike racer dragging his knee through the corners and think they need to lean as hard as they can off the side of the bike to make those fast and tight turns. Well, leaning off the side of your bike will likely cause you to lose traction and control, resulting in a crash. Riders who really know how to rail turns will hold a neutral body position and let the bike lean underneath them. It’s okay to allow your knees to bow out just a bit if it allows you to more comfortably lean the bike through turns. Remember to always stand during turns in order to unlock your body from the bike, maintaining a natural stance while your bike does the work for you. Another go-fast tip to work on is keeping your center of gravity low. Remember the attack position. This lowered stance over the bike will allow you to carry more speed through turns than a rider with a taller stance. Think about football players for a second. Just before two athletes collide, they both try to get as low as possible to improve their center of gravity. You can do the same on your bike. Another important thing to remember is to drive your weight through the bike. Focus on your belly button as your center of balance and drive weight through to your bottom bracket. It may also be helpful to remind yourself to drive weight through your pedals. Your hands, however, should have the light touch of an Italian sports car driver. Every time the trails point down, you have to stand up. Descending in a seated position is not only dangerous, it greatly limits your ability to toss around the bike. Our test riders never let the saddle touch them during a descent. This allows them to rock their hips back and forth, placing weight over the front or rear end as needed. Standing for your entire descent will require more fitness but will pay off with the ability to stay fluid, resulting in more comfort and speed. 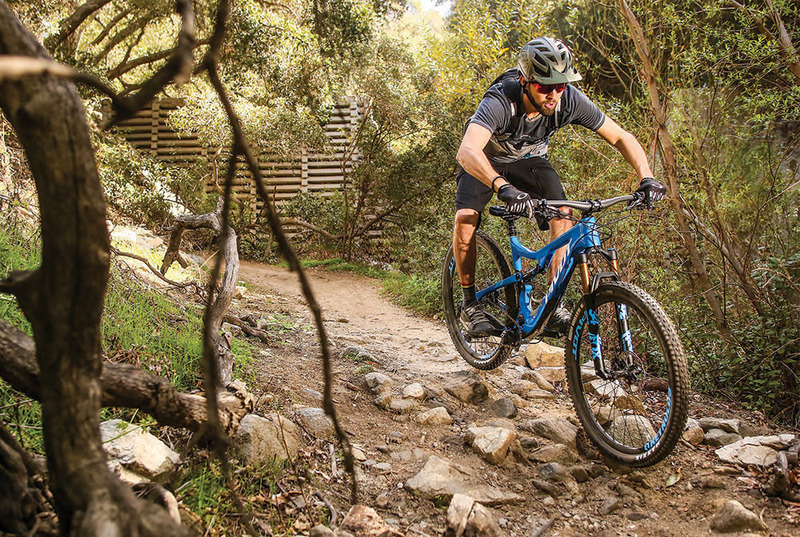 Now that you’ve learned the benefits of standing, it’s time to get out on the trails and shred. And, to make it even easier, we even took notes. Here are a few things you can work on during your next trail ride. • Force yourself to stand as much as possible. • Find a neutral body position over your bike and return to it every time you stand up. • Remind yourself of the fundamentals of the attack position: Head and eyes up, back flat, hips hinged, knees and elbows bent, and body weight forced through the bike to the ground. • Stay fluid on your bike and allow it to maneuver underneath you. •Don’t put too much pressure on yourself. It’s just riding bikes, and it should always be fun!